Ohio State WR Parris Campbell is fast. The college football season is in full swing, as we are now into the fifth week of a full slate of games. As long as you're taking in some of the action, here are some players who could make sense for the Philadelphia Eagles in the 2019 NFL Draft, in which the Birds are projected to have 12 picks. Clelin Ferrell, DE, Clemson (6'5, 260): Syracuse at (3) Clemson, 12:00 p.m.
Ferrell was a redshirt sophomore a season ago who could have come out, but he opted to stay at Clemson. In the first four games of 2018, he has torn up opposing offensive lines, as he has 15 tackles (6.5 for loss), 5 sacks, a forced fumble, and a fumble recovery for a touchdown. In 2017, he had 66 tackles (18 for loss), 9.5 sacks, and 2 forced fumbles. Ferrell has ideal size at 6'5, 260 for a 4-3 defensive end at the NFL level. While he plays on a loaded Clemson defensive line, you can see in the below video that he creates his own pressure. Ferrell is probably going to be out of reach for the Eagles to draft, barring a trade up. Still, as mentioned in previous Grocery Shopping posts, we're just going to profile all the top defensive line prospects, as this upcoming class is absolutely loaded with them, and the D-line is, in my view, the Eagles' biggest draft need next offseason. Mailbag: Should Eagles trade for Earl Thomas? Mitch Hyatt, OT, Clemson (6'5, 305): Syracuse at (3) Clemson, 12:00 p.m.
Hyatt was a big-time high school recruit, as he was rated 45th overall in the country in 2015. Hyatt was an immediate starter at Clemson, as he started 15 games as a true freshman in 2015. To date, he has played in 47 games at Clemson, including two National Championship appearances, and one additional BCS playoff game. Hyatt is still only 21 years old (he'll be 22 in February) and he already has outstanding high-level experience. Hyatt is undersized at 6'5, 305, and will likely have to put on more bulk in the NFL so he can anchor better against bull-rushing edge players. While he's very aggressive and has a nasty demeanor at times, he's not at all what you would consider being a drive-blocker in the run game. On the plus side, Hyatt has quick feet and the ability to neutralize speed guys. We still don't know quite yet what to make of Jordan Mailata's future with the team, but Hyatt could make sense as a far more experienced prospect if there are any doubts. Dalton Risner, OT, Kansas State (6'5, 300): (18) Texas at Kansas State, 3:30 p.m. The Eagles would be wise to continue to load up on offensive line talent, and Risner would be a player who they can eventually start at guard, and move around to account for injuries. 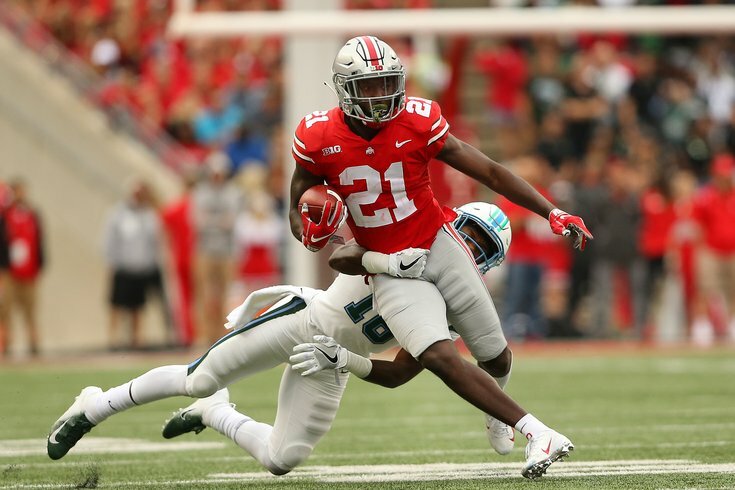 Parris Campbell, WR, Ohio State (6'1, 208): (4) Ohio State at (9) Penn State, 7:30 p.m.
And he returns kicks. So, you know, he potentially solves two issues on the Eagles' roster. Jalen Jelks, DE, Oregon (6'6, 245): (19) Oregon at (24) California, 10:30 p.m. In the NFL, Jelks projects to 4-3 defensive end, where teams can better utilize his explosiveness. While his 3-4 background won't help his college stats (he has just 14.5 sacks since 2015), his time being misused at Oregon will serve him well in the NFL as a run stopper. He could be a first round pick in the 2019 NFL Draft, but he's more projection than production.